New Refund - Triggers when a new refund is created. New Charge - Triggers when someone's credit card is charged. New Coupon - Triggers when you add a new Stripe coupon. New Plan - Triggers when you add a new Stripe plan. New Invoice - Triggers when a new invoice is created (supports line items). New Event - Triggers when a new event like a dispute, subscription, or transfer is added. New Customer - Triggers when a new customer is added. New Invoice Item - Triggers when a new invoice item is listed. Find Customer - Finds an existing customer by their Stripe ID. Find Charge - Finds an existing charge by its Stripe ID. You will also need to add your API key to this dialog. If you visit your account page at https://manage.stripe.com/account/apikeys you can find this under the API keys tab. 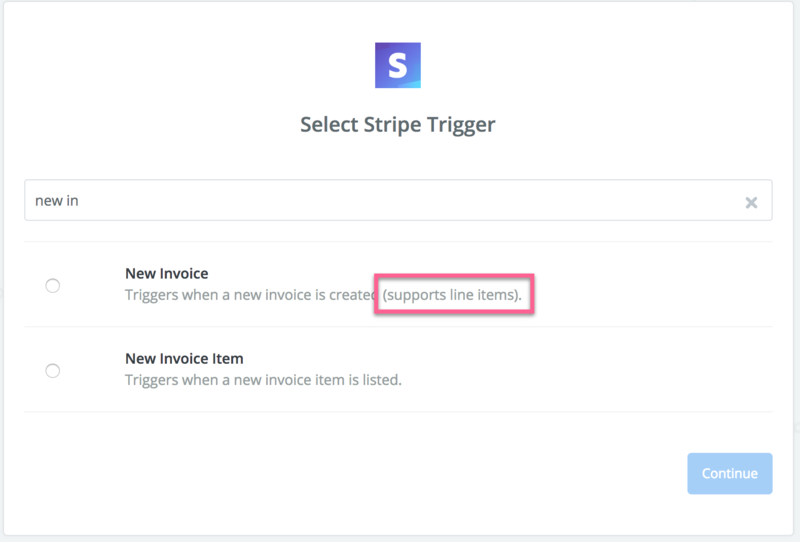 In Zapier's Stripe integration, the “New Invoice” trigger offers line item support. If you'd like your Zap to iterate over each individual item in an invoice, you'll want to use the “New Invoice Item” trigger. This is a common support issue, and the fix is simple! Usually this is because a "test" key is used to connect Zapier to Stripe and payments/customers/etc. are created on the "live" account (or vice versa). The solution is to make sure to use the correct key! Stripe sends the data over in cents (eg. 197000 instead of 1970.00), but you can use a Formatter step to convert the number into dollars before passing it to your action step. For emails to come in the "receipt email" field, you need to have email receipts enabled within Stripe. Read this article from Stripe on how to set up email receipts. We use Stripe API keys for authentication, so you can connect a Stripe account by using your Stripe "test secret key". 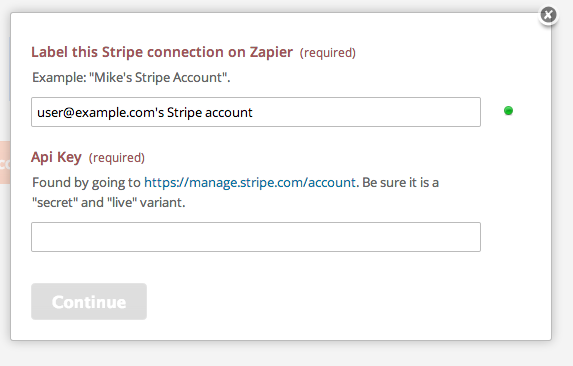 However, if you connect to Stripe using the test secret key, your Zap will not trigger on any Live transactions in your Stripe account. To do that, you'd need to reconnect, or connect a new Stripe account, using your "live secret key" instead.